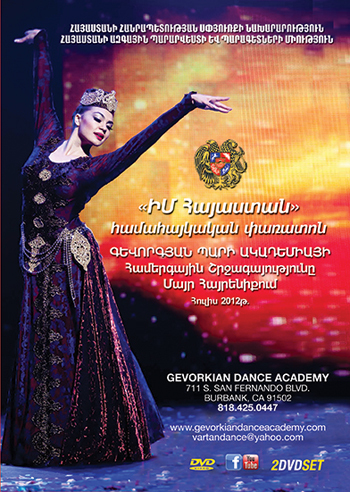 After conquering some of world’s most renowned stages, it was time for Gevorkian Dance Academy to return to its roots – to celebrate the 50th Birthday and the 30th Career Anniversary of Vartan Gevorkian. No other stage in Armenia offers more prestige than the Concert Hall in the Opera building named after Aram Khachatryan. One hundred dancers from 5 to 25 years old, born and raised in the United States, along with others that began their lives in other countries, traveled across the globe to honor their teacher and mentor in this celebration. A sold-out audience was blown away by the level of professionalism and maturity the dancers performed with. It was unimaginable yet evident that everyone was witnessing a generation, growing up thousands of miles always from their motherland, yet just as connected to the land, the language, and the art as any. DVD 1 is of the concert-celebration during which, Mr. Gevorkian was honored with a Medal of Komitas by the Minister of Diaspora, and by a Gold Medal from the University of Pedagogy. DVD 2 will take you alongside the dancers through the 2-week tour organized by the National Dance Association of Armenia. It will offer you a chance to relive as a viewer the unbelievable trip packed with visits to national historical sites, fun road trips and parties, elegant dinner events, visits to churches and our most memorable monuments and museums. Some argue that the highlight of DVD 2 is the honorable opening number performed by select members of the Academy at the Pan Armenian Festival. Others insist that the focal point is the performance by 16 select members of the Academy at the 80th birthday celebration of their teacher’s teacher – Suren Gyanjyumyan, followed by a solo tribute by Sona Gevorkian. You have an opportunity to decide for yourself.